Before the Baudelaires became orphans, before he encountered A Series of Unfortunate Events, even before the invention of Netflix, Lemony Snicket was a boy discovering the mysteries of the world.Match wits with Lemony Snicket to solve thirteen mini-mysteries.Paintings have been falling off of walls, a loud and loyal dog has gone missing, a specter has been seen walking the pier at midnight -- strange things are happening all over the town of Stain'd-By-The-Sea. 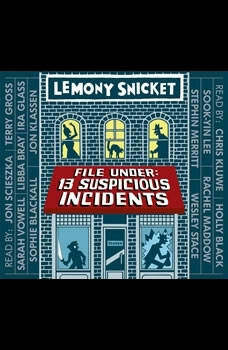 Called upon to investigate thirteen suspicious incidents, young Lemony Snicket collects clues, questions witnesses, and cracks every case. Join the investigation and tackle the mysteries alongside Snicket, then turn to the back of the book to see the solution revealed.A delicious read that welcomes readers into Lemony Snicket's world of deep mystery, mysterious depth, deductive reasoning, and reasonable deductions.